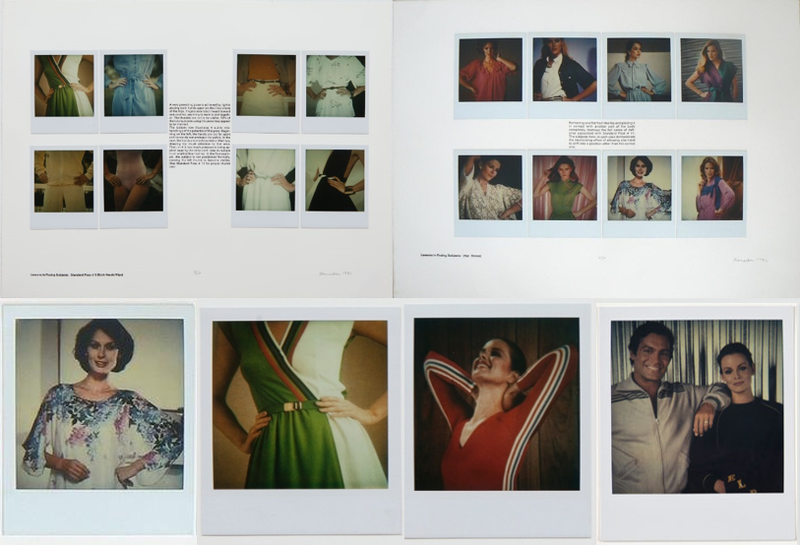 Saunter through Robert Heinecken’s Lessons in Posing Subjects this December and you’re likely to find yourself, quite inadvertently, re-enacting some of the models’ poses. Hand resting on one hip or tucked inside pockets, perhaps you even brush your hair nonchalantly from your face. Harmlessly trivial motions, so we thought, yet Heinecken’s work proves nothing in our visual culture comes without a catalogue of meaning. His interplay of text and image deconstructs body language with an acerbic twist, perhaps leaving you mulling over your chosen stance, but most definitely sending you away to ponder the commercial manipulation of what we assumed a natural pose. Re-photographing and then cutting models from their original magazine context, Heinecken transplanted them into worlds of his own creation. Placed against backdrops of everyday scenes, it’s as though they have been caught unaware in their own homes. Away from the demanding gaze of the consumer, Heineken asks us to reconsider. Are their poses more spontaneous now, more natural and un-staged, or does the gloss, lace and commercial seduction still lure us unavoidably from between the frames? Should we ignore the apparent artificiality, or can such poses only exist in this profitable context? With the camera as his tool, Heinecken enquires into the very nature of representation. By probing at this standard depiction of female identity, he considers how collective experiences are contextualised in the mass media; a code of self, shaped by the imagery itself. Heinecken’s attempt to throw our usual perception into disarray is heightened through the image’s accompanying text. Grouping together different models in the same pose, he adds in didactic instruction of how to perfectly master each one. Through this typology of body positions and facial expression, the standard fashion poses we are so accustomed to seeing are reduced to carefully staged, formal gestures. His blunt deconstruction snaps us from our typical stance as passive observer, urging us to reconsider the images we accept and consume without thinking twice; images that are increasingly the signifiers of reality itself. His series He/She, presents a selection of images of himself and friends that play on the idea of the Polaroid as the “bedroom camera.” Beneath, short lines of conversation are scrawled in pencil. Handwritten, they heighten the candid, personal feel, as though offering an insight into these intimate interactions. Yet the texts are entirely fabricated by Heinecken himself, fiction in autobiographical guise. Despite this artistic deceit, the text is nonetheless inextricably linked with our experience of the image itself. This complex relationship between image and text demonstrates how difficult pictures can be to read, with their multiplicity of possible meanings, and just how easily this can manipulated. 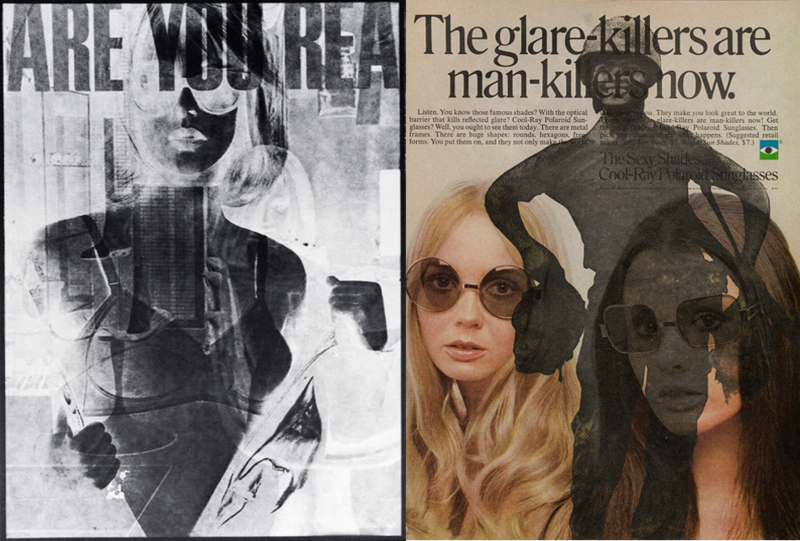 It’s an extension to his previous project, Are You Rea (1968), in which he superimposed both sides of a magazine page into one image, resulting in hilarious and sinister yet, more often than not, nonsensical fusions of image and text. In its epigraph, he quoted André Breton, ‘the mind has a marvellous facility in seizing the slightest rapport that exists between two objects taken at random’. This willingness to accept prescribed meaning is what our commercialised culture is founded on; meanings that are arbitrarily determined by advertisers. Heinecken’s work strives to understand the symbols and signs rooted in our cultural iconography, and his message has lost none of its urgency. It’s at the heart of advertising today, where perplexingly, the same tactics of female seduction are used to sell clothing to women and to arouse men in pornographic material. It’s even found in the everyday practice of self-creation and presentation that we embark upon via social media. And not to forget, it’s central to the overarching strive for beauty that dominates. For despite the complexity of Heinecken’s work or the messages it might convey, he was undeniably drawn to the simplicity of beauty. When asked during a guided tour whether Heineken’s exposure of the image’s artificiality reduces their beauty, curator Devrim Bayer responded with a smile, “No, I don’t think it does.” Perhaps it’s absurd to think that beauty can be deconstructed and reduced, and maybe beauty and artificiality are completely incompatible binaries anyway. Perhaps beauty always survives beyond the theory, no matter how destructive that theory aims to be. Yet, like all photographs, Polaroids are destined to fade, and eventually, Heinecken’s beauty will become engulfed in a white mist. It’s an enduring token of the impermanence of this beauty we endeavour to build our existence around.